I feel like a lot of people have been asking lately: “Do I really need an eye cream? Does it really work?” The answer to both of those questions is a very emphatic: “YES! !” The skin around our eyes is some of the most delicate, so we should be giving it the extra attention it deserves. This thin skin lacks the collagen and elastin fibers it would need to keep it looking young and plump forever. As the years go by, our eyes are affected by aging, the elements and even happy things like laughing, leaving behind expression lines and even deep wrinkles. Some people have more complaints about dark circles or puffiness, which can be genetic or due to lack of sleep or stress. Whatever the issue, there is an eye cream out there for you! And to help protect even further from environmental aggressors, be sure to always wear sunglasses when outside or driving. If there’s a time you can’t wear your sunnies or are in a situation where you prefer not to, like a wedding, invest in a SPF specifically formulated for the delicate eye area such as Skinceutical’s Physical Eye UV Defense Sunscreen. I know for a lot of people, seeing is believing, so here’s some photo evidence we took ourselves of G.M. 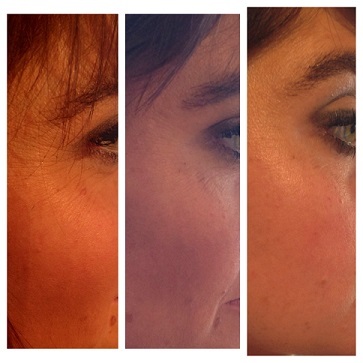 Collin’s Phtyo Stem Cell Eye Contour Cream doing it’s magic before, during and after! Come into Archbeauty today for an anti-aging eye treatment and to pick out which eye cream best suits your needs!